Hitachi has developed a way to store digital data that can last up to hundreds of millions of years and can withstand temperatures of up to one thousand degrees. Announced Monday in Tokyo, the device is made out of glass quartz (the same stuff they make laboratory beakers out of) is only 2 millimetres thick and can store up to a CD’s worth of information. Hitachi’s amazing new technology holds the data in binary form by creating dots inside the thin sheet of virtually indestructible glass. By using binary, no matter how advanced computers become, the data will always be readable. The chip, which looks like something you’d never want stuck in your shoe, is waterproof and fireproof protecting against possible natural calamities, such as fires and tsunamis. With the proliferation of digital media in the 20th century, Hitachi is addressing a major concern of how to better protect our precious files which in many CDS and hard drives will only last between 10 to 20 years. In other words, how else will a future generation of invading hybrid aliens be able to enjoy the sweet sounds of Kenny G or the cool beats of Jay Z? The square currently has up to 4 layers of dots, which can hold 40 megabytes per square inch and they say that adding more layers and more dots is no big deal at all. The device currently has no retail plans, but hopes to by the year 2015. Hitachi says, in the meantime, museums and religious institutions may use the chip. This all reminds me of a quote by the writer and thinker Steward Brand that goes, “The present moment used to be the unimaginable future.” Imagine what they’ll think in a hundred million years. Hitachi plans to give more information on the technology at the amazingly sci-fi sounding International Symposium on Optical Memory that will be held in Tokyo, Japan on September 30. Carbon- Answer To Future Tech? Over the past few years there has been an explosion of graphene-related news being reported throughout all avenues of media yet many people are unaware of what graphene is and why there is so much fuss over this mystery material. So, what is graphene? Also referred to as two-dimensional (2D) graphite, graphene is a planar mono-layer of tightly-packed carbon atoms arrayed into a honeycomb lattice (think of an ultrathin sheet of chicken wire). Graphene also serves as the basic building block of graphitic materials by being wrapped up into 0D fullerenes (a ball), rolled into 1D nanotubes, or layered into 3D stacks. Aside from being one of the thinnest, lightest, and strongest materials known, graphene is attractive to materials scientists and electrical engineers because of its unique electrical properties as a semi-conductor. Researchers have already exploited the unusual but versatile properties of graphene to build electronic components such as Nano transistors and ultra capacitors that may soon replace the current larger silicon-based ones. Discovery As it’s known today, the discovery of graphene is often attributed to Andre Geim and colleagues following their characterization of the material as a mono-layer in a 2004 ">Science publication. Historically, however, graphene was considered as “academic material” (i.e., it had no practical applications) and had been extensively studied since the 1960s but only in the multi-layer form. After the 2004 study in which Geim et al. were able to isolate mono-layer graphene by using adhesive tape to repeatedly exfoliate layers of a graphene crystal to a single atomic plane, the promising properties of 2D graphene has led to a research boom in the fields of materials science and condensed-matter physics. Although numerous methods (notably epitaxial growth on silicon carbide or metal substrates) for producing graphene have been developed albeit in small and/or “impure” quantities, it is expected that graphene production and application will take quantum leaps in a few short years. Transparent and flexible touch-screen organic LED (OLED) displays Researchers at Stanford University have successfully developed brand new concept of organic lighting-emitting diodes (OLEDs) with a few nanometer of graphene as transparent conductor. 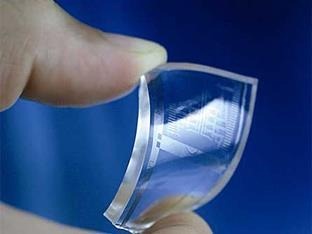 This paved the way for inexpensive mass production of OLEDs on large-area low-cost flexible plastic substrate, which could be rolled up like wallpaper and virtually applied to anywhere you want. Anti-bacterial paper packaging Researchers from Shanghai University said it had developed two water-based dispersible graphene derivatives can “effectively inhibit the growth of E. coli” that have minimal toxic effects on harming cells – so-called cytotoxicity. Higher-capacity and faster-charging batteries Researchers with the U.S. Department of Energy’s Lawrence Berkeley National Laboratory (Berkeley Lab) have created a graphene and tin Nano scale composite material for high-capacity energy storage in renewable lithium ion batteries. By encapsulating tin between sheets of graphene, the researchers constructed a new, lightweight "sandwich" structure that should bolster battery performance. Memory devices Hailed as the new "wonder material," graphene is being tapped by an international research team to help overcome issues associated with increasing the storage density and speed of electronic memory devices. Soon hospitals will be gifted with robotic workers who will have the strength to lift a disabled patient from bed. 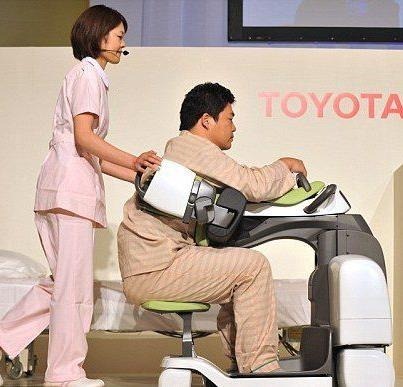 The robotic workers will be manufactured by Toyota. The mechanical health workers have been designed to meet the growing heal the related problems of aged population. It is for the very first time when robotic health workers are being designed for providing care to elders. It has been informed that the workers thus designed will help elders in getting up from bed and walking. The thought of manufacturing health workers was sparked from the bitter truth of shortage of medical staff. The demonstration of the robotic worker was given by Eiichi Saitoh, a Professor at Rehabilitation Medicine. Eiichi Saitoh has a paralyzed leg. While demonstrating the usefulness of the robotic worker he showed as to how the worker can bring a change in the life of disabled patients.